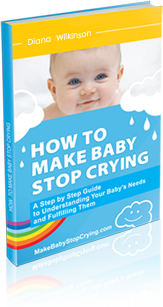 A baby’s cries can mean all kinds of different things, and to make baby stop crying, it’s helpful to understand why babies cry. Your baby could have unmet physical needs (she may be tired or hungry, for example), she may be sick, she may be in some kind of physical discomfort, or she may have emotional needs. If your child’s physical needs are met and she’s not ill, then many parents have found that massaging their baby helps in many situations. It could help your baby calm down when she is stressed, relax her if she is having a hard time falling asleep, or sometimes even relieve minor aches and pains like digestive discomfort. If you want to try a gentle massage with your baby, make sure you don’t do this too soon after eating, or else your baby might get an upset stomach or even vomit. (45 minutes after feeding is a good rule of thumb.) Also make sure your baby is willing to be massaged—if you start and she stiffens or turns away from you, then he or she might not be in the mood for it. And when a baby gives you these kinds of signals, it’s best to pay attention to what a baby needs! While there are some specific techniques you can use, you do not have to know any special methods. Any gentle kneading or stroking will be fine. (Just make sure not to touch so lightly as to tickle your baby.) Turn your baby onto her stomach and rub each area (head, neck, shoulders, etc., right on down to the feet and hands) for about a minute each. Then turn your baby onto her back and pay special attention to the arms and legs: stretch them out gently and bend them, then stretch out and bend both legs. Then repeat the rubbing pattern on your baby’s front side, taking about five minutes altogether. Your baby may stop crying or at least relax a little. Again, if she becomes more tense, do not continue the massage but rather try some other way to soothe him her. You might want to try the massage again in the future, however, since it sometimes takes a few tries before your baby starts to respond to it. If your baby seems calm or happy by the end of the first massage, then great! Now that you know that she might respond positively to it, you can try it again the next time your baby cries, or in other situations. For example, some parents use a massage as part of their child’s bedtime routine, to help their baby relax and go to sleep. Others simply use it as a great way to strengthen their bond with their babies.